John Urban is a master jeweller who has been handcrafting fine jewelery since 1974. John thrives on creating Celtic Wedding Rings with select works of interwoven art that ring true, with beauty on the surface, and meaning from within. Bug Ugly? Not to a female cicada, attracted by his beautiful music! This handsome fellow, the annual singing cicada, is shown lifesize. Do I dress up in a giant cicada disguise and hide in the trees with a net, to catch them? I used to; but now I just pick them up off the lawn, as their biological clock shuts off the lights soon after they've finished laying their eggs. For the longest time, I have been fascinated by the idea of flying. Wings, and the freedom they evoke, keep appearing in my dreams, and in my work. 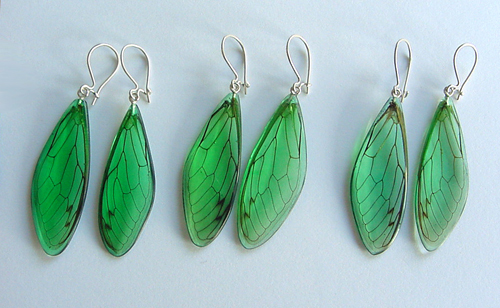 I made these earrings with actual cicada wings, embedded in lightweight acrylic resin, with sterling silver ear wires. 14kt gold loops and ear wires are also available. 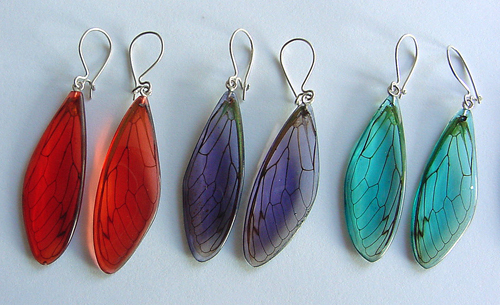 The Cicada Wing Earrings are sold in pairs (2 earrings), each of the same colour. If you are wondering, 'are those real insect wings?' The answer is yes. The Cicadas had completed their short life cycle before they gave up their very delicate wings. So, no insects were harmed in the creation of these unique earrings! PLEASE PHONE 1-819-422-3836 TO PLACE YOUR ORDER. Copyright 2017 John Urban All Rights Reserved.